The parish of Bixley is directly south east of the City of Norwich, and is set between Caistor St Edmund to the south west and Trowse with Newton to the north. Its name comes from the Old English for box wood grove, and it was certainly in existence at the time of the Domesday book (1086) where it is mentioned several times. This part of Norfolk is relatively rich in archaeological material, and Bixley is no exception, having been an important area of settlement since at least the Neolithic period. The earliest evidence of human activity that can be given a definite date comes in the form of a Mesolithic flint axe (NHER 18267) found on the surface of a field in 1982. However, this was an isolated find and it is in the Neolithic that more comprehensive settlement seems to have developed. Numerous flint tools of the period have been found within the parish, including polished axeheads (for example NHER 9874), scrapers and blades (NHER 20018) and a laurel leaf point (NHER 14555). Neolithic remains are not just confined to stone tools, however. There is evidence that Bixley was an important religious or ceremonial centre during the period. 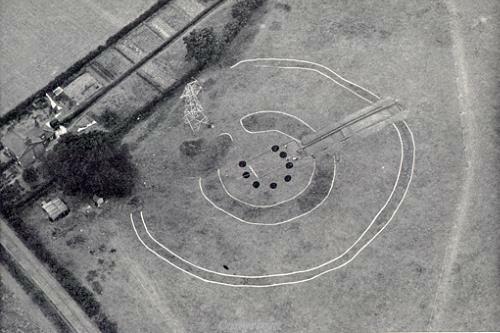 First seen from the air in 1929 as a double concentric ring with a central horseshoe pattern, Arminghall Henge (NHER 6100), situated in the west of the parish, emerged as one of the most important archaeological sites in Norfolk. Excavated in 1935, the double rings seen from the air proved to be ditches, the soil from which was thrown up to form a bank between them. The central horseshoe pattern of dark patches represented sockets for huge wooden posts, probably whole mature tree trunks. The site has been dated (by pottery and charcoal) to the Neolithic and classified as a henge, apparently for ceremonial purposes. 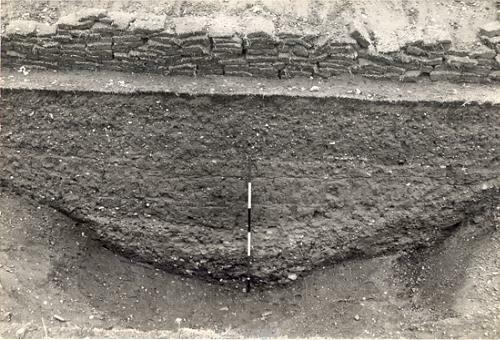 A section through the inner ditch of Arminghall Henge. During the gradual transition from the Neolithic to the Bronze Age, it is clear that the parish retained its importance as a spiritual centre. Apart from a few flint artefacts, there had been no evidence of Bronze Age activity until developments in aerial photography. These revealed that there were the remains of a group of Bronze Age burial mounds or barrows, all grouped around the site of the henge in the west of the parish. (NHER 6099, 9585, 9586, 9587 and 12776). These ‘ring ditches’ were originally circular mounds containing one or more burials or cremations, with a ditch (and sometimes multiple ditches) around their perimeter. Cultivation over the centuries flattened the mound until nothing was left except the ditch, which shows as a darker mark from the air. Several of them have been excavated ahead of road building, and have revealed human remains and cremation urns. The site of the henge and the barrow group is at the confluence of the Rivers Tas and Yare, and this may have been an important deciding factor in the location of both monuments. The archaeological record is almost silent on any evidence of human activity in the Iron Age, the sole find from this period being a silver coin (NHER 25975). It is, however one of the earliest known types of coin in England, dating to the 1st century BC. Considering that Bixley is adjacent to Caistor St Edmund, where the Romans built the town of Venta Icenorum, there is surprisingly little Roman archaeology in the parish. Metal detecting has recovered coins (NHER 28974), a box lid (NHER 29810) and a horse’s head figurine (NHER 25896). There have also been finds of Roman pottery (NHER 18000 and 20673), but the only other evidence from the period is the possible route of a road (NHER 9904) running east from the Roman town. Evidence of Saxon activity is also sparse, being limited to pottery fragments (NHER 20674), part of a mount (NHER 28974), and a decorated copper alloy wrist clasp (NHER 15607). The medieval period in Bixley seems to have seen an expansion in settlement. Although the parish is now relatively sparsely inhabited, in medieval times there were no less than three villages, Bixley (NHER 9960), Arminghall (NHER 9877) and Belhawe (NHER 12207), each with its own church. Today, only two of the churches survive, those which served Bixley and Arminghall. The villages themselves have vanished. Arminghall and Bixley can be seen on aerial photographs as house platforms, boundaries and sunken roads. Belhawe and its church have disappeared entirely. There are several theories as to why villages like these became deserted at the end of the Middle Ages, but it has been noted that there was a pattern of desertion in settlements around Norwich at this time, as people migrated to the city to look for work. Of the surviving churches, St Mary’s (NHER 9920), which was Arminghall’s church, dates to the 13th century, but was heavily restored and rebuilt in 1876. St Wandregesilius’ (NHER 1859) was Bixley’s church, the only one in England dedicated to this Saint. It may stand on the site of a Saxon minster, and was a pilgrimage centre prior to the Reformation. It has a 14th century west tower, but most of the rest is a rebuild of 1868. This isolated church now looks quite forlorn, as it was gutted by fire in 2004. It stands disused and facing an uncertain future. Medieval buildings of high status were also to be found in the parish in the form of moated manor houses. Manor House (NHER 9763) is a 19th century building, but stands on the site of the original moated manor, with parts of the moat still visible. The trend for moated houses continued into the early post medieval period; Arminghall Old Hall (NHER 6098) was a moated house dating to about 1600. It was finally demolished in 1920, but its magnificent carved 14th century stone entrance arch (originally from the Carmelite Friary in Norwich) can be seen on display in Norwich Magistrates Court. The parish also has an area of medieval woodland (NHER 34074) that still survives today. It should not be overlooked that a number of medieval objects have been recovered by metal detecting in the parish. These include coins, a brooch (NHER 28857), buckles (NHER 28974) and a jetton (NHER 35971). Pottery fragments have also been found. Surviving buildings from the post medieval period are rare. Bixley Hall (NHER 9876) was built in 1565, and then rebuilt in Queen Anne style in 1719. It was demolished in 1904, and only the cellars and parts of the walls remain. Bixley Mill (NHER 9697), a tower mill, was built in 1838, and was reputed to be the tallest in England at the time. Today, it has been shortened and converted to residential use. The most recent event on the record is a World War Two aircraft crash site (NHER 28555). A Lockheed Hudson crashed in 1942, fortunately without loss of life. Pieter Aldridge, 3 November 2005.